Double Irish arrangement is a tax scheme used by some U.S. corporations in Ireland (including Apple, Google and Facebook amongst others), to shield non-U.S. income from the pre Tax Cuts and Jobs Act of 2017 (TCJA) U.S. worldwide 35% tax system, and almost all Irish taxes. As the conduit by which U.S. corporations built up offshore reserves of approximately $1trn, the double Irish is the largest corporate tax avoidance structure in modern history. Feargal O'Rourke of the IFSC and a partner in PwC (son of Minister Mary O'Rourke, cousin of the 2008-2011 Irish Finance Minister Brian Lenihan Jnr) is regarded as its "grand architect". Alongside other Irish multinational tax tools, it has contributed to Ireland's rise to the top in many global lists of corporate tax havens. In the double Irish, one Irish subsidiary (IRL1) sells Intellectual Property-based products globally via royalty schemes (known as IP-based BEPS tools). The other Irish subsidiary (IRL2) is also incorporated in Ireland, but "managed" from a tax haven like Bermuda. The Irish tax code considers IRL2 a Bermuda company, but the U.S. tax code considers IRL2 an Irish company. Neither taxes it. A further Dutch sandwich avoids Irish withholding tax on moving money from IRL1 to IRL2. A Bermuda company (BER1), or Bermuda black hole, will often own IRL2. Using the double Irish requires intellectual property ("IP"). This limits use to technology, pharmaceutical, medical device and industrials with patents. In addition, non-U.S. firms tend to have territorial tax systems in their home country and do not need Irish tax structuring. This is why 14 of Ireland's top 20 firms are U.S. IP-heavy multinationals, and why there are no non-US/non-UK foreign multinationals in Ireland's top 50 firms (by revenue). U.S. IP-heavy multinationals now employ a quarter of Ireland's private sector workforce, pay 80% of Irish business tax, pay 50% of Irish salary tax and VAT, and create 57% of economic value-add. In 2015, after EU pressure, the Irish Government closed the double Irish, preventing an Irish company to be tax resident elsewhere. Existing schemes could continue to 2020. Despite this, U.S. corporate activity in Ireland increased, and Ireland became the most popular location for U.S. corporate tax inversions. Single malt arrangement leverages specific wording in some Irish tax treaties that can replicate the double Irish (IRL2 is re-located to Malta or the UAE). Thus the same <1% ETRs of the double Irish can be achieved. Single malt has been confirmed in use by Microsoft and Allergan in Ireland. Capital allowances for intangibles arrangement allows a broad range of internal intangible assets to be acquired by an Irish subsidiary, and the acquisition written off against Irish tax (a quasi-tax inversion). Apple restructured its double Irish into a capital allowances scheme (leprechaun economics). The U.S. move to a territorial tax system with the TCJA may materially affect the use of these Irish tax schemes by U.S. multinationals. The UK's similar changes in 2009-12 effectively stopped UK multinational use of Irish tax schemes. The TCJA's FDII and GILTI "carrot and stick" tax regimes makes U.S. effective tax rates very similar to Irish effective tax rates (even net of Irish tax schemes), for IP-heavy U.S. multinationals (11-12%). If the U.S. multinational cannot avail of any Irish BEPS scheme (i.e. single malt via Malta), and pays the full Irish 12.5% headline rate, then the net effective rate of over 14% makes Ireland unattractive from a tax perspective, versus relocating to the U.S, and availing of FDII. However, other technical issues (i.e. the EU's GDPR for Facebook, or Apple's pre-2020 clawbacks on its massive Irish capital allowances for intangible assets scheme) could influence the direction and timing of ultimate outcomes. U.S. corporations with intellectual property ("IP") can turn this into an intangible asset ("IA") and charge it out as a royalty payment. Royalty payments have been described as the raw material of global tax planning as they move profit streams between jurisdictions. The technical term for such use of IP is base erosion and profit shifting, or BEPS, which the OECD has been trying unsuccessfully to curtail (see IP-based BEPS tools). Corporations without large amounts of IP (which can be recorded as an IA on their balance sheet under GAAP rules), struggle to use these BEPS tax schemes. This structure has a problem. The pre-TCJA tax code allows foreign income to be left in foreign subsidiaries (deferring US taxes), but it will consider BER1 to be a controlled foreign corporation (or "CFC"), sheltering income from a related party transaction (i.e. IRL1). It will apply full US taxes to BER1 at 35%. To get around this, the US corporation needs to create a second Irish company (IRL2), legally incorporated in Ireland (so under the US tax code it is Irish), but which is "managed and controlled" from Bermuda (so under the Irish tax code it is from Bermuda). IRL2 will be placed between BER1 and IRL1 (i.e. owned by BER1, and owning IRL1). Up until the 2015 shut-down of the double Irish, the Irish tax code was one of the few that allowed a company be legally incorporated in its jurisdiction, but not be subject to its taxes (if managed and controlled elsewhere). The US corporation will "check-the-box" for IRL1 as it is clearly a foreign subsidiary selling to non-US locations. The US tax code will rightly ignore IRL1 from US tax calculations. However, because the US tax code also views IRL2 as foreign (i.e. Irish), it also ignores the transactions between IRL1 and IRL2 (even though they are related parties). This is the essence of the double Irish arrangement. Note that in some explanations and diagrams BER1 is omitted (the Bermuda black hole however, it is rare for a US corporation to "own" IRL2 directly). The Irish tax code levies a 20% withholding tax on transfers from an Irish company like IRL1, to companies in tax havens like BER1. However, if IRL1 sends the money to a new Dutch company DUT1, via another royalty payment scheme, no Irish withholding tax is payable as Ireland does not levy withholding tax on transfers within EU states. In addition, under the Dutch tax code DUT1 can send money to IRL2 under another royalty scheme without incurring Dutch withholding tax, as the Dutch do not charge withholding tax on royalty payment schemes. This is called the dutch sandwich and DUT1 is described as the "dutch slice" (sitting between IRL1 and IRL2). 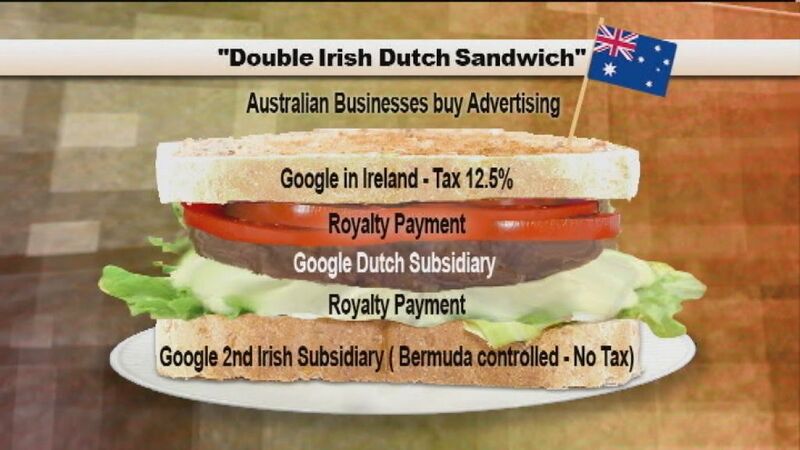 Thus, with the addition of IRL2 and DUT1, we have the "double Irish dutch sandwich" tax structure. In 2010, the Irish Government, on lobbying from PwC's Feargal O'Rourke, relaxed the rules for making royalty payments to non-EU countries without incurring Irish withholding tax (effectively ending the dutch sandwich), but they are subject to conditions that will not suit all double Irish arrangements. In 2010, the Obama administration was said to propose to tax excessive profits of offshore subsidiaries to curb tax avoidance in the United States. A 2010 Irish law brought Irish transfer pricing rules into line with most of its trading partners requiring companies' intra-group transfer prices to be similar to those that would be charged to (or from) independent entities. The first deadline for corporate tax submissions under the new rules was September 2012. However, companies such as Google, Oracle and FedEx are declaring fewer of their ongoing offshore subsidiaries in their public financial filings, which has the effect of reducing visibility of entities declared in known tax havens. In 2014, the Irish government announced that companies would no longer be able to incorporate in Ireland without also being tax resident there, a measure intended to counter arrangements similar to the double Irish. Irish Finance Minister Michael Noonan addressed the "Double Irish" during the presentation of his 2015 budget. Under the new rules, companies not already operating in the country may not pursue the "Double Irish" scheme as of 1 January 2015; and those already engaging in the tax avoidance scheme have a five-year window until the end of 2020 to find another arrangement. Under Finance Act 2015, a new system has been introduced whereby innovative companies who choose to incorporate in Ireland can now benefit from the introduction of the Knowledge Development Box (the "KDB") in Ireland, the scheme is seen as a replacement for the "double-Irish" tax system which was recently closed. An effective tax rate of 6.25% can be obtained on qualifying profits generated in periods commencing on or after 1 January 2016. Apple is Ireland's largest company, and represents a material proportion of Ireland's economy. Apple is one of the longest users of the double Irish tax scheme to achieve tax rates <1%, even as far back as 2004, and as investigated by the US Senate in May 2013, and covered in the main financial media. On 30 August 2016 the EU's competition commissioner concluded that Apple had received illegal State aid from Ireland. The Commission ordered Apple to pay €13 billion, plus interest, in unpaid Irish taxes for the ten year period, 2004-2014. Both the Irish government and Apple are appealing the Commission's action. Apple was not using the standard double Irish arrangement of two Irish companies (IRL1 in Ireland, and IRL2 in Bermuda). Instead, Apple combined the functions of the two companies inside one Irish company (namely, Apple Sales International, or ASI), which was split into two internal "branches". The Irish Revenue Commissioners' acceptance of Apple's branch structure, is what the EU Commission is challenging as illegal State aid, as no other multinational was given this ruling. The EU Commission has not taken cases against multinationals using the standard double Irish arrangement (e.g. Google, Facebook) to date. The Apple affair took another twist when Apple restructured Apple Sales International, as agreed with the EU Commission to cap post-2014 liability, in January 2015. It was shown in 2018 that this January 2015 restructuring was the driver of the 2015 Irish leprechaun economics GDP growth. Demonstrating this, additionally highlighted that Apple had used the expanded Irish capital allowances for intangible assets arrangement to re-structure its Irish subsidiaries in January 2015, which in itself could be subject to further EU Commission challenge as it cannot be used for explicit tax avoidance, and fines of a similar magnitude to the €13bn figure could ensue (see further potential Apple litigation). The EU Commission is currently investigating Apple's post January 2015 Irish structure. In 2014, as the Irish Government closed the "double Irish" arrangement, the influential US National Tax Journal published an article by Jeffrey L Rubinger and Summer Lepree, showing that Irish based subsidiaries of US corporations could replace the double Irish arrangement with a new structure (now known as single malt). If the Bermuda-controlled Irish company (IRL2) could be relocated to a country with whom (a) Ireland has a tax treaty, (b) with wording on "management and control" tax residency rules, and (c) had a zero corporate tax rate, then the double Irish effect could be replicated. They highlighted Malta as a candidate. The mainstream Irish media picked up this Rubinger and Lepree article at the time it was written. A 2017 report by Christian Aid titled "Impossible Structures", outlined how popular single malt BEPS tool has become. The report details money-flow diagrams, Microsoft's and Allergen's schemes and extracts from advisers to their clients. The Irish Finance Minister Paschal Donohoe said that it would be investigated. Inaction since the single malt structure was noted in 2014, raised questions regarding the Irish Government's stated policy of addressing corporate tax avoidance. In this regard, the Christian Aid report noted that the single malt IP-based BEPS tool would have been largely neutralised had the Irish Government not deliberately opted out of Article 12 (Disclosure of Aggressive Tax Planning) when signing the new OECD Multilateral Convention in July 2017 (which came from the base erosion and profit shifting (OECD project)). The double Irish and single malt are both royalty payment BEPS schemes where Ireland acts as a conduit to transfer profits from higher-tax locations to lower-tax locations. Ireland's third multinational BEPS scheme is called the capital allowances for intangible assets scheme, where Ireland acts as the terminus for the royalty payments. It is very similar to a corporate tax inversion of a multinational's non-US business, and with appropriate structuring, gives effective tax rates (ETRs) of 0-3%. Capital allowances for intangible assets is Ireland's long-term BEPS replacement for double Irish/single malt. It moves Ireland from being a frictionless (i.e. no taxes) conduit ofc via double Irish/single malt, to being an ultra-low tax (i.e. 0-3%, in perpuity, with correct planning) sink ofc. It is supported by the OECD (Ireland's IP-box is the first OECD-compliant structure), and the OECD BEPS project. During the financial crisis of 2009, the Irish Department of Finance's Tax Strategy Group, recommended material changes to the Irish capital allowances for intangible assets scheme. The 2009 Finance Act, materially expanded the range of intangible assets attracting Irish capital allowances which are fully deductible against Irish taxable profits. These "specified intangible assets" cover more esoteric intangibles such as types of general rights, general know-how, general goodwill, and the right to use software. It includes types of "internally developed" intangible assets and intangible assets purchased from "conntected parties". The control is that they must be acceptable under GAAP (older 2004 Irish GAAP is accepted), and thus auditable by an IFSC accounting firm. As an extra incentive, the 2009 Act reduced the period over which allowances are amortised (and "clawed-back"), from 15-17 years to 10 years (reduced to 5 years in the 2012 Finance Act for schemes after 13 February 2013). Thus, instead of the double Irish (or single malt) arrangement where IP assets are charged to Ireland from an offshore location (or Malta for single malt), the Irish subsidiary can now buy the IP assets, using an inter-company loan, and then write-off the IP acquisition cost over 5 years against Irish pre-tax profits, to give a 0-3% effective Irish corporate tax rate. IP-heavy industries such as technology, pharmaceutical, and medical devices, who have "product cycles", can re-fresh their capital allowances by creating new IP with each product cycle (in an offshore location), which the Irish subsidiary will continually acquire to "top-up" its Irish capital allowances. Thus, a 0-3% Irish corporate tax rate can be maintained indefinitely. When Apple, Ireland's largest company, restructured its double Irish subsidiaries in January 2015 (from the EU Commission ruling), it choose the Irish capital allowances schemes over a double Irish scheme (which it could have legitimately done in January 2015). As a quasi-inversion, with almost $300bn of IP "onshored", Apple's scheme had a dramatic effect on Irish GDP/GNP (leprechaun economics). Section 291A of the legislation states the Irish subsidiary must be conducting a "relevant trade" on the acquired IP. A "business plan" must be produced showing agreed levels of Irish employment, or "relevant activities", during the period capital allowances are claimed. If the subsidiary is wound up within 5 years (for plans after 13 February 2013), all allowances are repayable (the "clawback"). Given the dramatic take-up in the capital allowances scheme in 2015 (the leprechaun economics affair), when the cap was 100% (i.e. 0% Irish tax payable), Irish commentators questioned the merits of Coffey's recommendation. He responded in a paper (and of course, it would not be until 2018 that Coffey, and other commentators, could definitively confirm that leprechaun economics was almost all Apple). The Irish "capital allowances for intangible assets" arrangement thus gives an effective Irish corporation tax rate of 0 to 3%, in perpuity, depending on the cap rate at scheme start date (i.e. 80% or 100%).. The control is finding an Irish IFSC accounting firm who will help develop (offshore), value, acquire (onshore) and audit the artificially created internal group IP. I cannot see a justification for giving full Irish tax relief to the intragroup acquisition of a virtual asset, except that it is for the purposes of facilitating corporate tax avoidance. Apple's post Q1 2015 BEPS tax structure in Ireland has been called "the Green Jersey" by the EU Parliament's GUE-NGL body assessed in detail. From the mid-2000s, US multinationals increased their use of the Irish double Irish tax scheme (see table for Apple's ASI). These schemes artificially inflate Ireland's GDP/GNP to Ireland's GNI (a truer measure of Ireland's real economy). In contrast, the EU-28 average GDP is 100% of GNI (see table). By 2011, Ireland's ratio of GNI to GDP, had fallen to 80%. Or, expressed another way, Ireland's 2011 GDP was 125% of its GNI (the un-inflated Irish economy). The EU has been concerned at this, and discovered that 23% of 2010-2014 Irish GDP was just untaxed royalty payments (i.e. Irish GDP is 130% of Irish GNI). Irish financial commentators note how difficult it is to draw comparisons with other economies. The classic example is the comparison of Ireland's indebtedness (Public and Private) when expressed "per capita" versus when expressed "as % of GDP". On a 2017 "per capita" basis, Ireland is one of the most leveraged OECD countries (both on a Public Sector and on a Private Sector Debt basis). On a 2017 "% of GDP" basis, however, Ireland is deleveraging rapidly. Things got even more distorted when Apple restructured its Irish subsidiary in 2015 from a customised double Irish scheme, into a capital allowance for intangible asset scheme (behaves like a quasi-corporate tax inversion), and Irish GDP rose 26.3% in one quarter (see leprechaun economics). As a direct result of this, the Governor of the Central Bank of Ireland convened a steering group (Economic Statistics Review Group) to recommend economic statistics that would better represent the true position of the Irish economy. The result was the creation of a new metric, modified gross national income (or GNI*). The CSO estimated 2016 Irish GNI* (€190bn) was 30% below 2016 Irish GDP (€275bn) and Irish Debt/GNI* goes to 106% (Irish Debt/GDP was 73%). As Irish GNI was 23% below GDP before Apple's restructuring, many felt GNI* still overstates the Irish economy (and understates indebtedness). I would go a step further. At this point, multinational profit shifting doesn't just distort Ireland’s balance of payments; it constitutes Ireland’s balance of payments. The Irish Department of Finance produced a report in April 2014 quoting World Bank/PwC figures that Ireland's corporate effective tax rate (or ETR), was 12.3%. This figure contrasts with the known ETRs of the largest multinationals in Ireland (who use the double Irish and single malt tax schemes), which are <1%. It also contrasts with the known ETR of the third Irish tax scheme, capital allowances for intangibles, which has an ETR of 0-3% (depending on start date). The issue is that the Revenue Commissioners, and PwC/World Bank calculations, exclude income not considered taxable under the Irish corporate tax code (why their calculations are inherently self-fulfilling, at 12.5%). The example of Apple's, Apple Sales International (ASI), Ireland's largest company by some margin, shows the level of disconnect this approach can create compared to the reality of Irish taxes avoided. The Revenue Commissioners did not include ASI in Apple's Irish tax calculation. In contrast, when the EU Commission investigated ASI, they calculated an ETR for Apple in Ireland of 0.005%. The Commission's investigation concluded that Ireland granted illegal tax benefits to Apple, which enabled it to pay substantially less tax than other businesses over many years. In fact, this selective treatment allowed Apple to pay an effective corporate tax rate of 1 percent on its European profits in 2003 down to 0.005 percent in 2014. When the US Bureau of Economic Analysis ("BEA") approach is used (it adds up all Irish incorporated companies, including ASI, regardless of Irish taxability), the 2013 Irish effective tax rate is 2.2%. The BEA calculation of Ireland's effective tax rate has generated much debate and dispute, both in Ireland, and in the international media. The Irish Government and several Irish leading Irish economists and Irish tax advisors (including the creator of the double Irish, PwC's Feargal O'Rourke) claim that this is not a fair representation of Ireland's ETR rate as Ireland is only a "conduit" in cases like Apple. However, other tax specialists and financial commentators, highlight that the point of the BEA calculation is that it captures the scale of US tax avoidance that Ireland's corporate tax system and multinational tax schemes, facilitates. They point out that it is not the Irish CT "rate" that matters, but the Irish CT "regime". Applying a 12.5% rate in a tax code that shields most corporate profits from taxation, is indistinguishable from applying a near 0% rate in a normal tax code. Apple isn’t in Ireland primarily for Ireland’s 12.5 percent corporate tax rate. The goal of many U.S. multinational firms’ tax planning is globally untaxed profits, or something close to it. And Apple, it turns out, doesn’t pay that much tax in Ireland. Make no mistake: the headline rate is not what triggers tax evasion and aggressive tax planning. That comes from schemes that facilitate profit shifting. The Irish Auditor General now calculates the Irish corporate ETR on 8 different bases, which range from 2.2% (BEA method), to 15.5%. Foreign multinationals are key to Ireland's economy. They employ one quarter of Ireland's private sector workforce, pay 80% of Irish business taxes, and create 57% of private sector non-farm value-add. The past President of the Irish Tax Institute stated they pay 50% of all Irish salary taxes (due to higher paying jobs), 50% of all Irish VAT, and 92% of all Irish customs and excise duties. Discussed in more detail here. There are no non-US/non-UK foreign firms in Ireland's top 50 firms by turnover (and one by employees, German retailer Lidl). This is because non-US multinationals have territorial tax systems which charge low tax rates on foreign income. The UK multinationals in Ireland (apart from UK retailers, like Tesco), are pre-2009 corporate tax inversions, before the UK moved to a territorial tax system. Outside of these pre-2009 UK corporate tax inversions, foreign multinationals in Ireland are almost all US multinationals, using double Irish, single malt and capital allowance tax schemes to shield themselves from pre-2017 TCJA worldwide taxation system and its 35% tax. US multinationals make up 14 of Ireland's top 20 companies, and Ireland is the largest recipient of US corporate tax inversions. The move to a territorial tax system, with a 21% US tax rate and a 13.125% IP tax rate, under the US Tax Cuts and Jobs Act of 2017 ("TCJA") is a challenge to Ireland's three tax schemes. As a "carrot", the TCJA enables these firms to charge out their IP globally (just like with a double Irish or single malt arrangement) but from a US base, at a preferential FDII tax rate of 13.125% . In addition, the extra reliefs of 100% capital expensing, and 21% relief on US costs, make the effective FDII rate 1-2% lower again (or 11-12%). As a "stick", the TCJA GILTI tax rate forces these firms to pay a minimum US tax rate of 10.5% on their global IP, regardless of where their IP is located. In addition, only getting 80% relief (not 100%), against foreign taxes paid, means that the effective GILTI rate is 1-2% higher again (or 11-12%, similar to the net FDII rate). The new GILTI tax regime, which acts like an international alternative minimum tax for IP-heavy US multinationals, has led some to qualify the new US TCJA system as a quasi-territorial tax system. Before the 2017 TCJA, US multinationals, with the necessary required IP to use Irish multinational tax schemes, could achieve effective Irish tax rates of 0-3% versus 35% in the US. After the 2017 TCJA, these same multinationals can now use this IP to generate US effective tax rates, which net of additional US reliefs, are similar to what they will pay in Ireland post GILTI (circa 11-12%). In fact, whereas using the double Irish in its single malt form (via Malta), gives an effective U.S. corporate tax rate of circa 12.2%, not being able to use any Irish BEPS scheme, and paying the full Irish 12.5% headline rate, gives an effective U.S. tax rate of circa 14.13%, which makes Ireland prohibitively expensive to U.S. multinationals (versus basing the IP in the U.S. under the 13.125% FDII rate). U.S. multinationals like Pfizer announced in Q1 2018, a post-TCJA global tax rate for 2019 of circa 17%, which is very similar to the circa 16% expected by past U.S. multinational Irish tax inversions, Eaton, Allergan, and Medtronic. This is the effect of Pfizer being able to use the new U.S. 13.125% FDII regime, as well as the new U.S. BEAT regime penalising non-U.S. multinationals (and past tax inversions) by taxing income leaving the U.S. to go to low-tax corporate tax havens like Ireland. Facebook Ireland, Ireland's 9th largest company, has a double Irish scheme in Ireland. As a result of the increased liability and restructions of the 2018 EU GDPR regime, Facebook have decided to move all their non-EU accounts hosted in Facebook Ireland (circa 1.5bn accounts of 2.3bn total global accounts) back to the US, where data laws are more favourable. Apple Ireland, Ireland's largest company, restructured their double Irish scheme into an Irish capital allowance scheme in January 2015 (earlier). Capital allowances schemes started after February 2013 have a clawback of allowances if the scheme is terminated within 5 years. As this is €3bn per annum (see leprechaun economics) for Apple, they are unlikely to be leaving Ireland pre 2020. 1 2 "Pinning Down Apple's Alleged 0.005% Tax Rate Is Nearly Impossible". 1 September 2016. 1 2 3 "Senate Probe Finds Apple Used Unusual Tax Structure to Avoid Taxes". Reuters. Retrieved 20 May 2013. 1 2 "After a Tax Crackdown, Apple Found a New Shelter for Its Profits". New York Times. 6 November 2017. 1 2 3 "'Double Irish' and 'Dutch Sandwich' saved Google $3.7bn in tax in 2016". Irish Times. 2 January 2018. ↑ "Google's 'Dutch Sandwich' Shielded 16 Billion Euros From Tax". Bloomberg. 2 January 2018. 1 2 3 4 5 "'Double Irish' limits Facebook's tax bill to €1.9m in Ireland". Financial Times. 5 December 2013. 1 2 3 "Facebook paid just €30m tax in Ireland despite earning €12bn". Irish Indepdenent. 29 November 2017. 1 2 "Facebook Ireland pays tax of just €30m on €12.6bn". Irish Examiner. 29 November 2017. 1 2 "Oracle paid just €11m tax on Irish turnover of €7bn". Irish Independent. 28 April 2014. 1 2 3 "Ireland: Where Profits Pile Up, Helping Multinationals Keep Taxes Low". Bloomberg. 2014. 1 2 "How to stop the inversion perversion". The Economist. 26 July 2014. 1 2 "A Territorial Tax System Would Create Jobs and Raise Wages for U.S. Workers". The Heritage Foundation. 12 September 2013. 1 2 "What is the Double Irish". Financial Times. 9 October 2014. ↑ "The real story behind US companies' offshore cash reserves". McKinsey & Company. June 2017. ↑ "US corporate giants hoarding more than a trillion dollars". The Guardian. 20 May 2016. ↑ "Apple vs the EU is the biggest tax battle in history". Time Magazine. 30 August 2016. 1 2 "Man Making Ireland Tax Avoidance Hub Proves Local Hero". Bloomberg News. 28 October 2013. ↑ "Scion of a prominent political dynasty who gave his vote to accountancy". Irish Times. 8 May 2015. 1 2 3 "Controversial tax strategies brainchild of O'Rourke's son". Irish Independent. 3 November 2013. ↑ "Feargal O'Rourke Turning Ireland Into 'A Global Tax-Avoidance Hub'". Broadsheet Ireland. 29 October 2013. 1 2 3 "Double Irish Tax Sandwich". Rose Law. 1 November 2013. 1 2 "Profit Shifting and "Aggressive" Tax Planning by Multinational Firms" (PDF). Centre for European Economic Research (ZEW). October 2013. p. 3. 1 2 "Intellectual Property Tax Planning in the light of Base Erosion and Profit Shifting". University of Tilburg. June 2017. p. 30. 1 2 3 4 5 6 7 8 9 "Ireland's Top 1000 Companies". Irish Times. 2018. 1 2 3 4 "IRELAND Trade and Statistical Note 2017" (PDF). OECD. 2017. 1 2 "An Analysis of 2015 Corporation Tax Returns and 2016 Payments" (PDF). Revenue Commissioners. April 2017. 1 2 "FactCheck: How much do multinationals actually contribute in taxes?". thejournal.ie. 9 September 2016. ↑ "Brussels in crackdown on 'double Irish' tax loophole". Financial Times. October 2014. 1 2 "Ireland's move to close the 'double Irish' tax loophole unlikely to bother Apple, Google". The Guardian. October 2014. 1 2 3 4 5 "'Impossible' structures: tax outcomes overlooked by the 2015 tax Spillover analysis" (PDF). Christian Aid. November 2017. 1 2 "Tracking Tax Runaways". Bloomberg News. 1 March 2017. ↑ "Days of 'Double Irish' tax scheme are numbered, says PwC's O'Rourke". Irish Times. 30 October 2013. ↑ "Multinationals replacing 'Double Irish' with new tax avoidance scheme". RTE News. 14 November 2017. ↑ "How often is the 'Single Malt' tax loophole used? The government is finding out". thejournal.ie. 15 November 2017. 1 2 "Paschal Donohoe says Government will examine 'Single Malt' loophole". The Irish Times. 14 November 2017. 1 2 3 4 5 6 "Maples and Calder Irish Intellectual Property Tax Regime - 2.5% Effective Tax". Maples and Calder Law Firm. February 2018. 1 2 3 4 "Tax Avoidance and the Irish Balance of Payments". Council on Foreign Relations. 25 April 2018. 1 2 "Apple's Exports Aren't Missing: They Are in Ireland". Council on Foreign Relations. 30 October 2017. 1 2 3 "Breaking Down the New U.S. Corporate Tax Law". Harvard Business Review. 26 December 2017. 1 2 "Trump's US tax reform a significant challenge for Ireland". Irish Times. 30 November 2017. 1 2 "US corporations could be saying goodbye to Ireland". Irish Times. 17 January 2018. 1 2 "Vantiv decides against Inversion". Bloomberg News. 10 August 2017. 1 2 "How Tax Reform solved UK inversions". Tax Foundation. 14 October 2014. 1 2 "The United Kingdom's Experience with Inversions". Tax Foundation. 5 April 2016. 1 2 "Inversions under the New Tax Law: Carrot and Stick". Tax Foundation. 13 March 2018. ↑ "Trump's US tax reform a significant challenge for Ireland". Irish Times. 30 November 2017. 1 2 "A Hybrid Approach: The Treatment of Foreign Profits under the Tax Cuts and Jobs Act". Tax Foundation. 3 May 2018. 1 2 "Reassessing the Beloved Double Irish Structure (as Single Malt) in Light of GILTI". Taxnotes. 23 April 2018. 1 2 "Exclusive: Facebook to put 1.5 billion users out of reach of new EU privacy law". Reuters News. 19 April 2018. 1 2 "Facebook to put 1.5bn users out of reach of new EU GDPR privacy law". Irish Times. 19 April 2018. 1 2 "Coffey: Strong Irish corporate tax receipts 'sustainable' until 2020". Irish Times. 12 September 2017. ↑ "The Corporate Tax Avoidance Toolbox". B&R Beurs. 2018. ↑ "Figure 5.1 The Double Irish (October Fiscal Monitor)". IMF. October 2013. ↑ "Taxation Guide to Investing in Ireland" (PDF). A&L Goodbody. June 2016. ↑ "Stingy Stones avoid tax on £240m fortune | Mail Online". Dailymail.co.uk. 2006-08-02. Retrieved 2013-01-23. ↑ "'Dutch Sandwich' saves Google and many other U.S. companies billions in taxes". MSNBC. 22 October 2010. ↑ "Man Making Ireland Tax Avoidance Hub Proves Local Hero"
↑ "Treatment of Certain Patent Royalties Paid to Companies Resident Outside the State (e-brief 55/10)". Irish Revenue. June 2010. ↑ "Ireland Expands Withholding Tax Exemption On Royalties". Mason Hayes Curran Law Firm. August 2010. ↑ "Withhold No More - Outbound Patent Royalties Can Be Paid Gross". Matheson Law. June 2011. 1 2 3 4 5 6 Drucker, Jesse (21 October 2010). "Google 2.4% Rate Shows How $60 Billion Lost to Tax Loopholes – Bloomberg". www.bloomberg.com. ↑ Erb, Kelly. "Ireland Declares 'Double Irish' Tax Scheme Dead". Retrieved 2015-05-24. ↑ Garside, Juliette. "Tax avoidance. War of words hots up between US and EU over tax avoidance". Retrieved 2016-08-25. ↑ "THE EUROPEAN COMMISSION'S RECENT STATE AID INVESTIGATIONS OF TRANSFER PRICING RULINGS" (PDF). Retrieved 2016-08-25. ↑ Baker, Jennifer. "Apple cored —Apple must pay Ireland €13B in taxes, rules European Commission". Retrieved 2016-08-30. ↑ "Quarter of Irish economic growth due to Apple's iPhone, says IMF". RTE News. 17 April 2018. ↑ "iPhone exports accounted for quarter of Irish economic growth in 2017 - IMF". Irish Times. 17 April 2018. ↑ "Apple's cash mountain, how it avoids tax, and the Irish link". Irish Times. 6 November 2017. ↑ Harry McGee. "Apple tax appeal: The three arguments Government to use". Irish Times. Retrieved 3 September 2016. ↑ Tim Cook. "A Message to the Apple Community in Europe". apple.com. Retrieved 3 September 2016. ↑ "Apple's Irish company structure key to EU tax finding". Irish Times. Retrieved 2 September 2016. ↑ "The Rotten Apple: Tax Avoidance in Ireland". The International Trade Journal. 2 August 2017. ↑ "Google pays €47m in tax in Ireland on €22bn sales revenue". The Guardian. 4 November 2016. ↑ "EU Commission Decision on State Aid by Ireland to Apple" (PDF). Apple (Ireland). 30 August 2016. Retrieved 14 November 2016. ↑ "EU asks for more details of Apple's tax affairs". The Times. 8 November 2017. 1 2 "Death of the "Double Irish Dutch Sandwich"? Not so Fast". Taxes Without Borders. 23 October 2014. 1 2 "Multinationals replacing 'Double Irish' with new tax avoidance scheme". The Irish Independent. 9 November 2014. ↑ "Three years of silence on 'Single Malt' tax loophole raises questions". Irish Times. 16 November 2017. ↑ "Multilateral Instrument: Department of Finance announces Irish positions". Deloitte. June 2017. ↑ "'Impossible' structures: tax outcomes overlooked by the 2015 tax Spillover analysis (Page 3)" (PDF). Christian Aid. November 2017. 1 2 3 4 5 6 7 "Uses of Ireland for German Companies: Irish "Intellectual Property" Tax of 2.5% ETR" (PDF). Arthur Cox Law Firm. January 2012. p. 3. 1 2 3 4 "World IP Day: IRELAND'S 2.5% IP Tax Rate (Section 4.1.1)". Mason Hayes and Curran. April 2013. 1 2 3 4 5 6 "Ireland as a Location for Your Intellectual Property Trading Company" (PDF). Arthur Cox Law. April 2015. ↑ "Ireland's Intellectual Property Regime". BDO Ireland. October 2016. ↑ "Ireland's Tax Regime for Investing in Intellectual Property" (PDF). FGS Partnership. June 2011. ↑ "Tax Strategy Group: Irish Corporate Taxation" (PDF). October 2010. p. 5. ↑ "Tax Strategy Group: Irish Corporate Taxation" (PDF). October 2011. p. 7. 1 2 3 4 "Corporate Taxation in Ireland 2016" (PDF). Industrial Development Authority (IDA). 2018. 1 2 3 "Intangible Assets Scheme under Section 291A Taxes Consolidation Act 1997" (PDF). Irish Revenue. 2010. 1 2 3 "Capital Allowances for Intangible Assets under section 291A of the Taxes Consolidation Act 1997 (Part 9 / Chapter2)" (PDF). Irish Revenue. February 2018. ↑ "Capital Allowances for Intangible Assets "Specified Assets"". Irish Revenue. September 2017. ↑ "Ireland as a Location for Your Intellectual Property Trading Company" (PDF). Arthur Cox Law. April 2015. ↑ "Intellectual Property Tax". KPMG. 4 December 2017. 1 2 "Firm gets tax relief on $7bn rights: Accenture". Irish Examiner. 24 January 2012. ↑ "What Apple did next". Seamus Coffey, University College Cork. 24 January 2014. ↑ "Capital allowances for intangible assets". Irish Revenue. 15 September 2017. ↑ "Minister Donohoe publishes Review of Ireland's Corporation Tax Code". Department of Finance. 21 December 2017. 1 2 "REVIEW OF IRELAND'S CORPORATION TAX CODE, PRESENTED TO THE MINISTER FOR FINANCE AND PUBLIC EXPENDITURE AND REFORM BY MR. SEAMUS COFFEY" (PDF). Department of Finance. 30 January 2017. ↑ "Tax break for IP transfers is cut to 80pc". Department of Finance. 11 October 2017. ↑ "Revenue eBrief No. 016/18 Capital allowances for specified intangible assets". Irish Revenue. 2 February 2018. 1 2 "Intangibles, taxation and Ireland's contribution to the EU Budget". Seamus Coffey. 19 October 2017. ↑ "IRISH ECONOMY: Intangibles, taxation and Ireland's contribution to the EU Budget". irisheconomy.ie. 19 October 2017. ↑ "Base Erosion and Profit Shifting (BEPS) tax diagnostic toolkit". PriceWaterhouseCoopers. 2016. ↑ "MNE Tax Strategies in Ireland" (PDF). Trinity College Dublin. 2016. ↑ "Apple's Irish Tax Deals". European United Left–Nordic Green Left. June 2018. ↑ "New Report on Apple's New Irish Tax Structure". Tax Justice Network. June 2018. ↑ "After a Tax Crackdown, Apple Found a New Shelter for Its Profits". New York Times. 6 November 2017. 1 2 3 "CRISIS RECOVERY IN A COUNTRY WITH A HIGH PRESENCE OF FOREIGN OWNED COMPANIES" (PDF). IMK Institute, Berlin. January 2017. ↑ "International GNI to GDP Comparisons". Seamus Coffey, University College Cork. 29 April 2013. 1 2 "Europe points finger at Ireland over tax avoidance". Irish Times. 7 March 2018. ↑ "Who owes more money - the Irish or the Greeks?". Irish Times. 4 June 2015. ↑ "Why do the Irish still owe more than the Greeks?". Irish Times. 7 March 2017. ↑ "National debt now €44000 per head". Irish Independent. 7 July 2017. ↑ "Report of the Economic Statistics Review Group". Central Statistics Office. 4 February 2017. ↑ "Leprechaun-proofing economic data". RTE News. 4 February 2017. ↑ "CSO paints a very different picture of Irish economy with new measure". Irish Times. 15 July 2017. ↑ "New economic Leprechaun on loose as rate of growth plunges". Irish Independent. 15 July 2017. ↑ "Globalisation at work in statistics — Questions arising from the 'Irish case'" (PDF). EuroStat. December 2017. ↑ "Ireland's deglobalised data to calculate a smaller economy". Financial Times. 17 July 2017. ↑ "Effective Corporate Tax in Ireland: April 2014" (PDF). Department of Finance. April 2014. ↑ "Revenue insists it collected all taxes Apple owed". Irish Times. 30 August 2016. 1 2 "State aid: Ireland gave illegal tax benefits to Apple worth up to €13 billion". EU Commission. 30 August 2016. ↑ "Almost half of Irish-registered firms' profits 'cannot be taxed'". Irish Times. 18 June 2014. ↑ "Effective Corporate Tax calculations: 2.2%". Irish Times. 14 February 2014. ↑ "Multinationals escape tax due to 'exceptional' rules, study claims". Irish Times. 6 May 2014. ↑ "Irish PM counters corporate tax rate claims". CNBC. February 2014. ↑ "Multinational companies paid just 2.2 per cent tax in 2011 - report". thejournal.ie. 15 February 2014. ↑ "Irish Effective Tax Rates". Seamus Coffey (irisheconomy.ie). 11 February 2014. ↑ "Corporate Tax 2014: Feargal O'Rourke's Irish tax fairytales and "meaningless" US data". Finfacts. 14 February 2014. 1 2 "Weil on Finance: Yes, Ireland Is a Tax Haven". Bloomberg News. 11 February 2014. ↑ "If Ireland Is Not A Tax Haven, What Is It?". Forbes. November 2014. ↑ "Apple Tax Case and the Implications for Ireland" (PDF). Professor Jim Stewart, Trinity College Dublin. 28 June 2017. p. 19. ↑ "Multinationals pay lower taxes than a decade ago". Financial Times. 11 March 2018. ↑ "Auditor General Report on Corporate Tax Chapter 20 (Figure 20.8)" (PDF). Auditor General. April 2017. p. 294. ↑ "Donald Trump singles out Ireland in tax speech". Irish Times. 29 November 2017. 1 2 3 "Tax Reform - Considerations for U.S. Multinationals". Lexology. 9 March 2018. ↑ "A GILTI Trap Waiting to Spring". Alvarez & Marshal. March 2018. ↑ "U.S. Tax Cuts and Jobs Act: Winners and Losers". Taxnotes. 19 March 2018. p. 1235. ↑ "Irish Revenue Note for Guidance on Intangible Assets". Chartered Accountants of Ireland. 2016. ↑ "Abbott Laboratories Irish subsidiary paid no tax on €1.8 billion profit". The Irish Times. 31 May 2013. ↑ "Abbott subsidiaries paid no tax on €2.9 billion profits". Sligo Today. 1 2 3 4 5 6 7 8 Chitum, Ryan (2007). "How 60 billion are lost in tax loopholes", Bloomberg. ↑ "The Sharing Economy Doesn't Share the Wealth". Bloomberg News. 6 April 2016. Retrieved 7 April 2017. ↑ "Low Irish taxes boost Airbnb profits". EURACTIV. 22 July 2014. Retrieved 7 April 2017. ↑ "How Google saved $2 billion in income tax – Times of India". www.timesofindia.com. 11 December 2012. ↑ "IBM gooses its sales numbers thanks to overseas tax tricks". ARS Technica. 4 February 2014. ↑ "Medtronic's $43 Billion Covidien Buyout Is More Than Just A Tax Saving Deal". Forbes. 14 June 2014. ↑ "Corporate Tax 2014: Yahoo! joins "Double Irish Dutch Sandwich" club; IDA Ireland wants more members". FinFacts Ireland. 10 February 2014.